In 1885, Robert Ridgeway described the Cozumel Thrasher (Harporhynchus guttatus) for the first time and then in 1886 published his findings in Description of some new bird species from Cozumel Island, Yucatan in the Proceedings of the Biological Society of Washington 3:2-24. Locally, the bird is known as el Cuitlacoche de Cozumel. 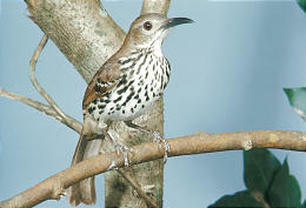 The bird is very similar to the Long-billed Thrasher (H. longirostris) found on the Yucatan Peninsula but differs from this species genetically and is endemic to the island. If you see one of these birds, please call the Fundación de Parques y Museos de Cozumel, as they are currently involved in recording all possible sightings.